Free download Robo Army game for PC. It is an arcade game developed by SNK. Robo Army is a neo geo game and it is played as mission game. The game play of the game is very similar to Final Fight PC Game. Each mission takes place into a specific area. In first mission, your robot fights with other robot army. It can increase its live line by picking up power after killing the enemies. At some places, your robot will become a robot car that crushes the enemies quickly. This robot car will disappear after few seconds. There are also some animal robots just like dogs. There will be a large robot dog, you have to defeat. 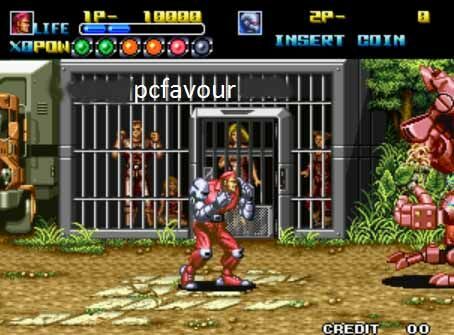 In first mission, you have to kill the first powerful enemy and free you people from cell. This game is very easy to play and download. After download the game, follow the instructions to play the game.